The performance tests carried out by the rCUDA team leveraging the new Connect-IB cards, along with the new NVIDIA Tesla K40 GPU, revealed that rCUDA is able to provide almost the same bandwidth as original CUDA. Our testbed was composed of two Ivy Bridge Xeon based computers equipped with the new dual-port Mellanox Connect-IB cards and a K40 Tesla GPU installed in one of the systems. In this hardware configuration, the maximum data transfer rate achieved by the bandwidthTest benchmark from the NVIDIA CUDA Samples when using local CUDA was 10.06GB/s. In the case of using rCUDA to transfer data from main memory of one computer to the GPU installed in the other computer, the same bandwidthTest benchmark achieved a maximum data transfer rate of 9.91GB/s. This means that rCUDA is able to attain 98.5% of CUDA’s bandwidth, thus introducing a negligible performance loss. If you missed the rCUDA presentation at SC13 last week, you can still take a look at it at our presentation repository. You can also download the white papers presented during the show about the use of rCUDA with SLURM, GPUDirect RDMA, ARM, several applications and also FAQs. We are pleased to provide you the link to the rCUDA presentation made in the Mellanox theatre during the Supercomputing Conference 2013 in Denver, CO, last November. The presentation was titled "rCUDA: Share and Aggregate GPUs in Your Cluster", and provided a quick overview of the main features of rCUDA. You can find the presentation here. 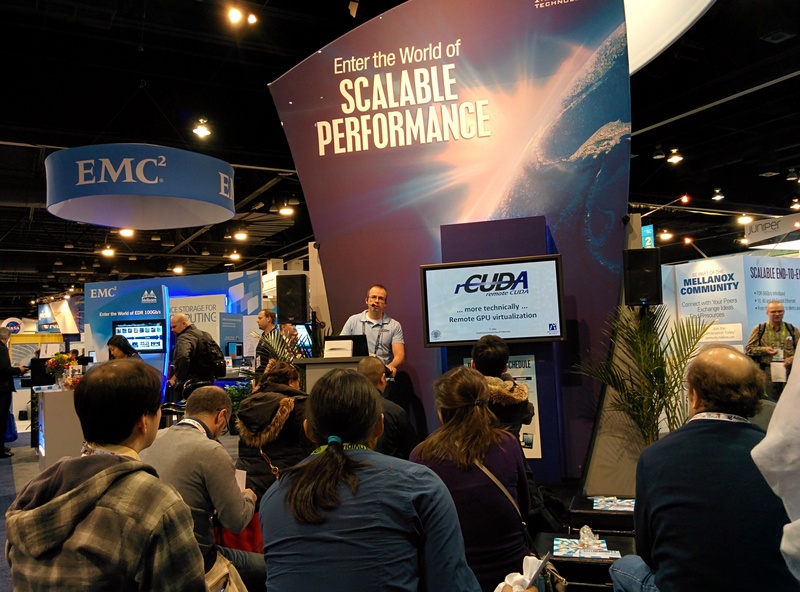 The rCUDA team will provide a 15 minutes talk about its remote GPU virtualization technology on Thursday, November 21 at 11:45am at Mellanox Technologies booth #2722 at SC13 in Denver, CO. Please come to the talk and see how rCUDA can reduce the cost of your computing equipment. The rCUDA team is glad to announce that its remote GPU virtualization middleware has been successfully tested with the new NVIDIA's K40 Tesla GPU. We are conducting several performance tests and will provide results very soon.